LOS ANGELES—OCT 28, 2015—IndieCade, the premier international festival of independent games, honored the winners of the 2015 IndieCade Awards at an event last Thursday evening, during IndieCade Festival 2015 in Culver City. In addition, the annual ‘Choice Awards,’ which are voted on by the attending media, developers and audience, were also presented. LOS ANGELES (March 17, 2013) – Skybound Entertainment and IndieCade, the nation’s premier independent game festival, are pleased to announce a new strategic partnership between the two companies. 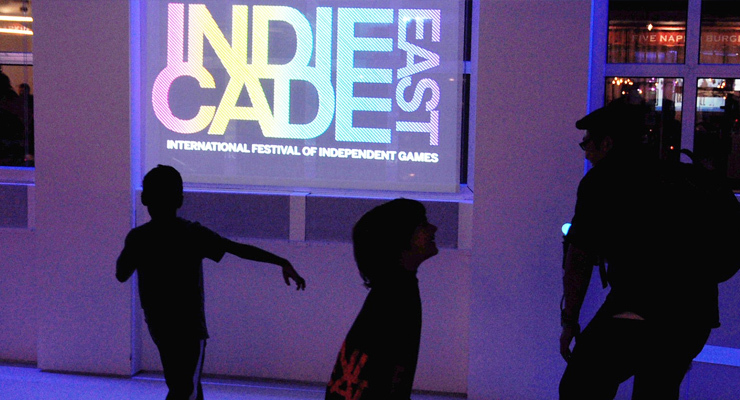 IndieCade East Is This Week — We’ll Be There! We’ve been extremely fortunate over the last year to have the opportunity to lend a hand to IndieCade, an outstanding organization that stands for the promotion and fostering of independent developers and games the world over. Their work has brought forward many great games — like Braid — and helped countless independent and aspiring developers make key connections with established industry players (and each other). In addition, the conference sessions allow developers to learn from one another, to refine their artistry and create even more compelling games. This year’s IndieCade East is no different. With amazing KEYNOTES, a diverse lineup of SESSIONS, and an amazing selection of curated GAMES, all on display at the Museum of the Moving Image in Astoria. Whether you’re an aspiring developer, a gamer, or someone who is into the future of the art of the moving image and interactive entertainment, IndieCade is the place to be this week. This year’s theme carries overtones of love, loss and consent and showcases the artistry of games and the expression of the creators. Not to mention, Maverick PR Partner Matt Frary will be hosting a session for independent developers on Public Relations @ 1:30 on Sunday. So come and learn a few tips n’ tricks to get some buzz for your project! If you live in NYC, you could do a lot worse on Valentine’s Day weekend than seeing independent artists and their amazing creations. So come on down to the Museum of the Moving Image Fri-Sun. Or, sit in on a wildly informative session about Public Relations. Who says Valentine’s romance is dead? http://mavpr.com/wp-content/uploads/2017/02/mavgearlogo-base-with-name_INVERSE-enfold-copy.png 0 0 Maverick http://mavpr.com/wp-content/uploads/2017/02/mavgearlogo-base-with-name_INVERSE-enfold-copy.png Maverick2015-02-09 09:04:442015-02-09 09:04:44IndieCade East Is This Week -- We'll Be There! LOS ANGELES—SEPT 12, 2014—IndieCade, the premier international festival of independent games, has revealed a diverse lineup of more than 35 games that are official nominees for awards at IndieCade Festival 2014 to be held in Culver City, CA October 9-12, 2014. The festival celebrates nearly 150 of the most creative and exciting independent games of the year while also establishing a leading voice in the promotion, cultivation, and community of independent games development.